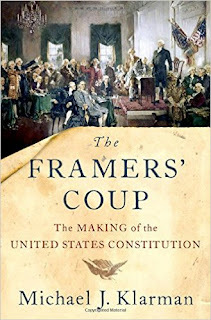 This week and next at Balkinization we are hosting a symposium on Michael Klarman's new book, The Framers' Coup: The Making of the United States Constitution (Oxford University Press 2016). We have assembled a terrific group of commentators, including Jud Campbell (Richmond), James Fox (Stetson), Mark Graber (Maryland), Steve Griffin (Tulane), Calvin Johnson (Texas), Sanford Levinson (Texas), Laura Kalman (UC Santa Barbara), Christina Mulligan (Brooklyn), Ryan Williams (Boston College), and myself. At the conclusion, Mike will respond to the commentators.